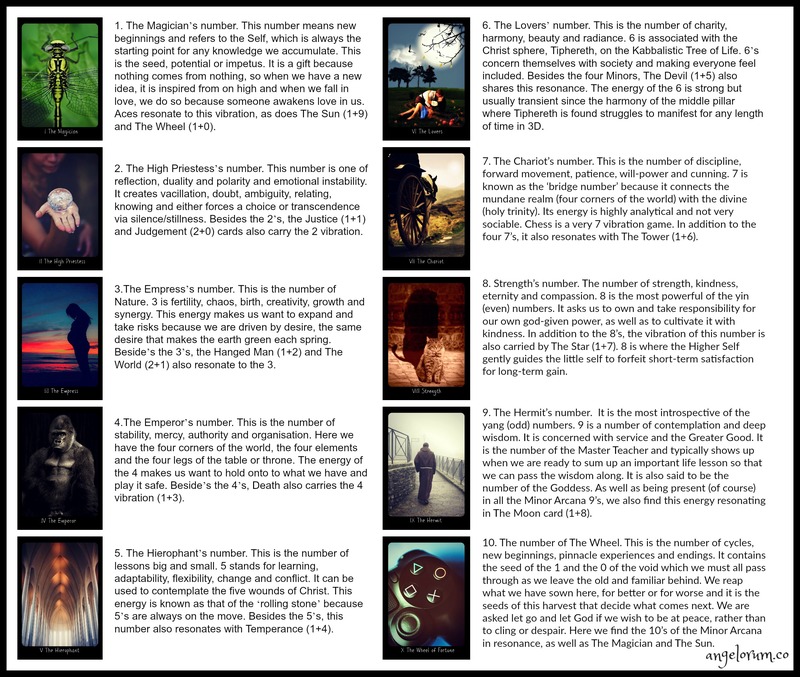 In the Tarot, numbers are important – as important as the images and card titles. Numbers carry a vibration and give us a world of information if we know what to look for and how to interpret it. Not only are the individual numbers important but so are repetitions and the sum total of the numbers in a spread can be used for an overall theme. The latter is called ‘taking the quint.’ Quint is short for quintessence a term used in alchemy and medieval philosophy. The Magician’s number. This number means new beginnings and refers to the Self, which is always the starting point for any knowledge we accumulate. This is the seed, potential or impetus. It is a gift because nothing comes from nothing, so when we have a new idea, it is inspired from on high and when we fall in love, we do so because someone awakens love in us. Aces resonate to this vibration, as does The Sun (1+9) and The Wheel (1+0). The High Priestess’s number. This number is one of reflection, duality and polarity and emotional instability. It creates vacillation, doubt, ambiguity, relating, knowing and either forces a choice or transcendence via silence/stillness. Besides the 2’s, the Justice (1+1) and Judgement (2+0) cards also carry the 2 vibration. The Empress’s number. This is the number of Nature. 3 is fertility, chaos, birth, creativity, growth and synergy. This energy makes us want to expand and take risks because we are driven by desire, the same desire that makes the earth green each spring. Beside’s the 3’s, the Hanged Man (1+2) and The World (2+1) also resonate to the 3. The Emperor’s number. This is the number of stability, mercy, authority and organisation. Here we have the four corners of the world, the four elements and the four legs of the table or throne. The energy of the 4 makes us want to hold onto to what we have and play it safe. Beside’s the 4’s, Death also carries the 4 vibration (1+3). The Hierophant’s number. This is the number of lessons big and small. 5 stands for learning, adaptability, flexibility, change and conflict. It can be used to contemplate the five wounds of Christ. This energy is known as that of the ‘rolling stone’ because 5’s are always on the move. Besides the 5’s, this number also resonates with Temperance (1+4). The Lovers’ number. This is the number of charity, harmony, beauty and radiance. 6 is associated with the Christ sphere, Tiphereth, on the Kabbalistic Tree of Life. 6’s concern themselves with society and making everyone feel included. Besides the four Minors, The Devil (1+5) also shares this resonance. The energy of the 6 is strong but usually transient since the harmony of the middle pillar where Tiphereth is found struggles to manifest for any length of time in 3D. The Chariot’s number. This is the number of discipline, forward movement, patience, will-power and cunning. 7 is known as the ‘bridge number’ because it connects the mundane realm (four corners of the world) with the divine (holy trinity). Its energy is highly analytical and not very sociable. Chess is a very 7 vibration game. In addition to the four 7’s, it also resonates with The Tower (1+6). Strength’s number. The number of strength, kindness, eternity and compassion. 8 is the most powerful of the yin (even) numbers. It asks us to own and take responsibility for our own god-given power, as well as to cultivate it with kindness. In addition to the 8’s, the vibration of this number is also carried by The Star (1+7). 8 is where the Higher Self gently guides the little self to forfeit short-term satisfaction for long-term gain. The Hermit’s number. It is the most introspective of the yang (odd) numbers. 9 is a number of contemplation and deep wisdom. It is concerned with service and the Greater Good. It is the number of the Master Teacher and typically shows up when we are ready to sum up an important life lesson so that we can pass the wisdom along. It is also said to be the number of the Goddess. As well as being present (of course) in all the Minor Arcana 9’s, we also find this energy resonating in The Moon card (1+8). The number of The Wheel. This is the number of cycles, new beginnings, pinnacle experiences and endings. It contains the seed of the 1 and the 0 of the void which we must all pass through as we leave the old and familiar behind. We reap what we have sown here, for better or for worse and it is the seeds of this harvest that decide what comes next. We are asked let go and let God if we wish to be at peace, rather than to cling or despair. Here we find the 10’s of the Minor Arcana in resonance, as well as The Magician and The Sun. So the question I hear you asking next is, of course, ‘How do we take the quint when there are Court Cards in the mix since they don’t have numbers?’ I’m ever so glad you asked! It’s quite simple really: Pages = 11, Knights = 12, Queens = 13 and Kings = 14. Other ways to work with Tarot Numerology is for calculating your birth cards and your year card. When number cards repeat themselves in a spread the Numerological component of the reading is stressed. Here is a key for meanings when you are dealing with pairings and multiples in love tarot readings… but you can also think of these repetitions in terms of Angel Numbers if you prefer. I hope you find this guide useful. Please pass it along in your social media channels.